I started investing on the p2p lending marketplace Mintos in January 2015. Nearly 4 years have passed. Most of the time my strategy was buy-and-hold, that is I invested in loans with the intention to hold them till maturity. That’s also what I had been doing at the majority of other p2p lending platforms. In the beginning of the year I had a large chunk of high-interest, longer-term Mogo car loans, together with some mid/longer-term loans of other originators on Mintos. After many of the Mogo loans were bought back in summer I decided to switch to a completly different strategy on Mintos. Thereafter I concentrated on trading, that is buying loans on the secondary market and selling them at a higher price on the secondary market again, usually holding these loans only for a short time frame. When Mintos introduced the Secondary Market Autoinvest Feature in October my strategy got a boost. 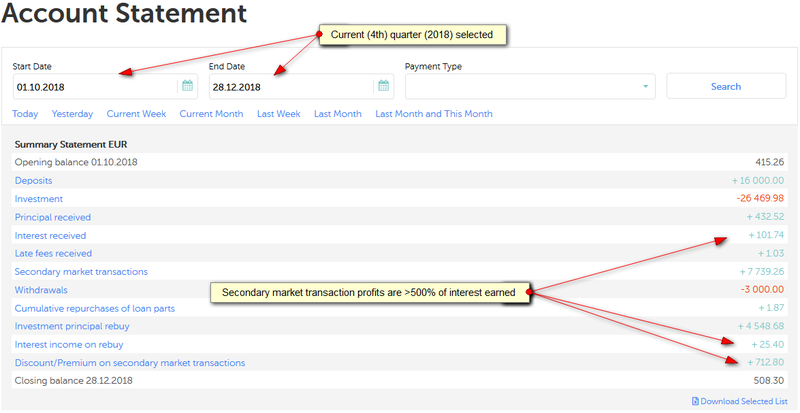 As you can see in the screenshot above I made 712.80 EUR profit from trading (buying and selling) loans in the fourth quarter. Compare that to the 127.14 EUR (101.74+25.40) interest earned. Obviously trading has been much more profitable. I consider it not much riskier than my previous buy and hold strategy as I was able to maintain a reasonable level of diversification over several investors. But of course investing on Mintos is high risk anyway. Which loans did I select for trading? It all comes down to buying cheap and selling at a higher price. My experience is that this works best with mid-term, EUR BB loans. With short term or very long term loans the impact of premiums und discount is to high / to low on the YTM for a good turn-around of inventory. Below is a snapshot of the loans currently in my Mintos portfolio today – of course the composition changes very frequently with this strategy. It can be observed that loan ranges between 18 and 42 months dominate my portfolio, which consists of 478 indiviudal loan parts. Also loans with 13% and higher interest rates are overweighted. This trading strategy worked very well for me in the past quarter. It would probably not scale, if an investor tried to deploy much more capital, as loan supply that matches my criteria for buying is limited and competition is increasing. The Net Annual Return (NAR value) Mintos displays for my return has been constantly increasing this quarter and today is at 14.74%. Remember this is calculated for the whole time since I started investing, so since January 2015. If I would calculate this figure only for this quarter results, it would be much higher. So what to expect in 2019? Interest rates on Mintos have been fluctating over the past years. In the last months they have risen considerably. Possibly a seasonal effect. I have no idea whether they can rise a little further still, or have peaked and will fluctate back in the other direction for a few month. Also the economic cycle might turn. I will stick to my buying and selling strategy for now and for this strategy supply and demand on the secondary market is much more important than whether the interest rates are 1 or 2% higher or lower as most of my result is generated from secondary market gains rather than interest earned. Also I am acutely aware of the risk that the huge number of originators pose. Even if Mintos does a good job of vetting and monitoring the originators, the sheer number of originators statistically means that chances that one of them might get into financial trouble are not neglectabe. For indivual investors the only viable measure to have some protection (and to reduce losses in that case) is diversification across several originators. I do hope that 2019 will be a very profitable year for Mintos investors! New investors signing up via this link on Mintos, get 1% cashbark on all investments they make in the first 90 days after registration. Do you sell only at par or also with discounts and premiums? I find it very cumbersome when not selling at par to evaluate the resulting YTM for each loan , do all the clicks and keep track of them. At discount, par or premium – it all depends on the parameters of the loan. How do you sell the loan at higher price? Mintos says “Amount exceeds the amount of the investment you own!” everytime I try to do it. Cheers, very nice blog btw. If you get this message, you are trying to sell a loan part at a premium, that would cause the YTM to become negative for the buyer. This can especially happen if the loan part has very little time remaining until maturity. How much of your portfolio would you say you have in P2P platforms ? How has the trading strategy worked so far in 2019?? Not as good as in Oct/Nov, but still doing okay. My displayed Net Annual Return is now over 15%. My autoinvest for the secondary market has not been picking up more than a few loans since I started it in December. And when I try to manually find loans, they are never discounted more than -0,1 to -0,2 percent. But admitted, I do not browse for them more than 1-2 per week.